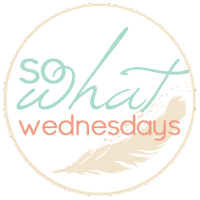 Keeping up with The Caseys: So What Wednesday. Thanks to Shannon for this link up today! 1. If my basement had aquarium amounts of water in it yesterday. 3. If my computers crashed at work and now I have to work Friday, I still had a 5 day weekend. 4. If my little dog's nails are so long that I'm thinking of changing his name to Laqueesha. Seriously, though, they look like macaronis. 5. If today is going to be almost 60 and I'm working. ALL DAY. 6. If I ate a cookie dough sundae last night with hot fudge and peanut butter and the scale went up 1.5 lbs this am. 7. If I'm seriously thinking about reproducing. No big deal. 8. If the hubs took the car out Saturday night and there is a large fry dumped in my back seat, lettuce stuck to my passenger seat, and greasy finger prints everywhere. 9. If my St. Patty's day crafts are still hanging out in the craft room and have yet to be hung up. I am struggling with no spend march too! I started a list for April with things I want..it is gonna be bad!! Oh no, water in the basement is no good. I always have intentions to do a no spend month, but I just cant. Maybe I need to start smaller like "no nail polish or target clothes month"
That sundae sounds delicious. I think we need to let ourselves eat something "bad" once a week or so. Seriously thinking about reproducing?! I love how you just throw that in there like it's no big deal! Haha, very exciting! Ughh, the frickin' water in the basement... mine had some in it last night, which meant that my laundry that was piled on the floor was all wet. Gross! Luckily it was just towels that can be replaced! A little Jess!? That will be fun. Remember practice makes perfect. Water in the basement? No bueno. Greasy fingerprints all over the car! Sounds like someone had too much fun! Um..excuse me miss, but I thought we were going to do a No Spend April too? hmmm? And MAKE ME A BABY. Gosh. And...that sundae was totally worth it. Don't forget about our date tonight. There's really not much worse in this world than the smell of cold french fries locked in the backseat of a car.G ag.